Plastic-free food.. If you have tried Plastic-Free Tuesdays, or other plastic free initiatives such as Plastic-Free July or Plastic-Free September (Muoviton Syyskuu in Finnish), you have no doubt found out by now that one of the hardest things to get plastic-free is your daily food. We all need food multiple times a day, and so much of it is in plastic nowadays! Rather overwhelming at first. From plastic-wrapped carrots, to plastic bananas, to plastic pasta, plastic rice, plastic potatoes, you name it and it comes in plastic! Yet, by now I have found many options to not purchase food which is packaged in plastic. Earlier, I already wrote about my regular successful trips to the market, where it’s easy to find lots of fresh produce, such as veggies, fruit, bread and cheese, plastic-free. I am proud to say that I have bought hardly any fruit or veggies in plastic wrapping since I started Plastic-Free Tuesday about 5-6 months ago, not only on Tuesdays, but for all days of the week. Once you start to change your habits it all comes naturally I find. 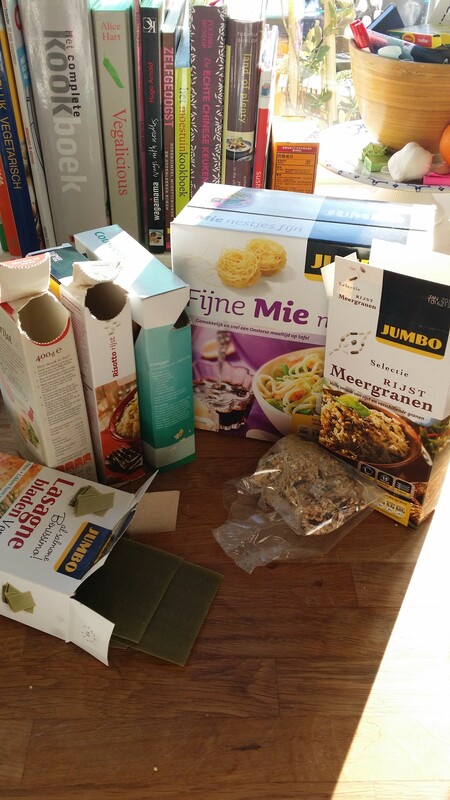 In any case, these staple foods require a different shopping strategy, such as bulk bins in (specialized) shops, but these are not common in the Netherlands, at least not in my town, or at affordable prices. So, here goes for some plastic-free shopping tips from the supermarket. Most foods, I’ve found, are actually available both in plastic and in carton, so you can opt for carton easily over plastic if you like, and you recycle or compost that. It might be different at your supermarket, but I am sure you can find at least some of these options. In any case, I’d be interested to know how you go about these! Various kinds of rice are sold at my supermarket both in cardboard boxes and in plastic, such as basmati rice, plain white rice, whole rice etc. Of course, it is easy to pick the cardboard container over the plastic on Plastic Free-Tuesday or other days. Again, the best would be bulk, as it saves the inked carton from the environment as well. But no-plastic is an option here for me! Both plastic and plastic-free options in the supermarket. Unfortunately, even with carton, I’ve found that sometimes there can be this super annoying *plastic surprise* within the cardboard packaging! You open the box only to find… plastic inside … Argh! #doublefail. Carton AND plastic! 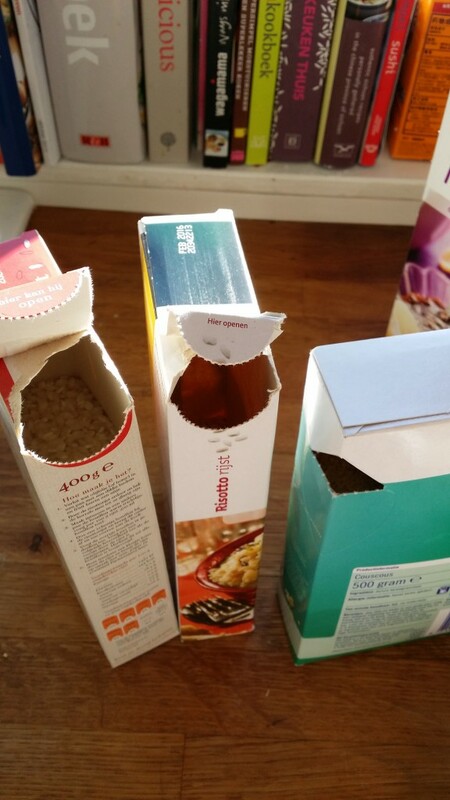 However, I think I can give you a tip there: check if there is a special cutting/outline in the carton on the outside, to ease pouring from the packet (see pictures below). If there is, likely no plastic inside! Oempfh, *plastic surprise* in the middle. Otherwise, all recyclable cardboard packaging. No plastic. 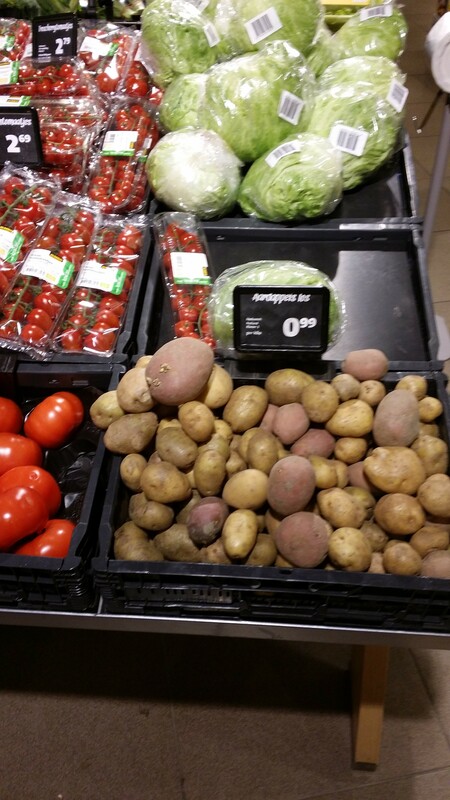 Plastic-free bulk potatoes. Get how many you need, bring your own bag, or simply load into your basket. All four types I’ve found in cardboard boxes, easy as that.. Spaghetti has a cardboard box option at most places. Lasagna too. Pasta is more difficult, and I get from the Barilla brand only. Lasagna from the supermarket without plastic wrapping inside. 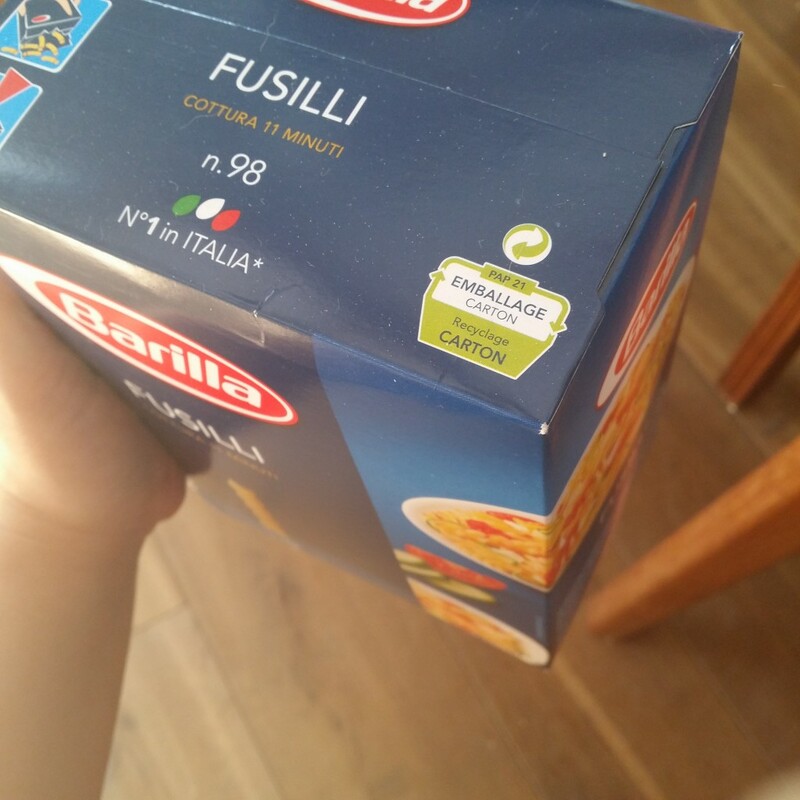 Barilla pasta without plastic, in “recyclable carton”. Moving on to potentially more complicated ones, but also one of my favorites and easy plastic-free options: risotto rice! Love risotto with fresh beetroot, carrot, mushroom, cilantro and goats cheese (from the market), or with garlic, onion, mushroom, zucchini, fresh basil, and grated Parmesan! Yumm. Have also found this staple food at various places packed in carton. Beware of *surprise plastic* though, check the carton. A tricky one is noodles! Most noodles are in plastic as Chiara rightly observed in an earlier post on making her own noodles, and my favorite Chinese ones certainly are.. I recently attempted to make my own as well and will draw up a blog about it if I’ve tried a couple of times 🙂 For ease, I am now often still sticking to the type of Indonesian style noodles I can find in my supermarket, for stir fries, see below. Keep you posted on noodle recipes. Noodles in carton from Jumbo supermarket. 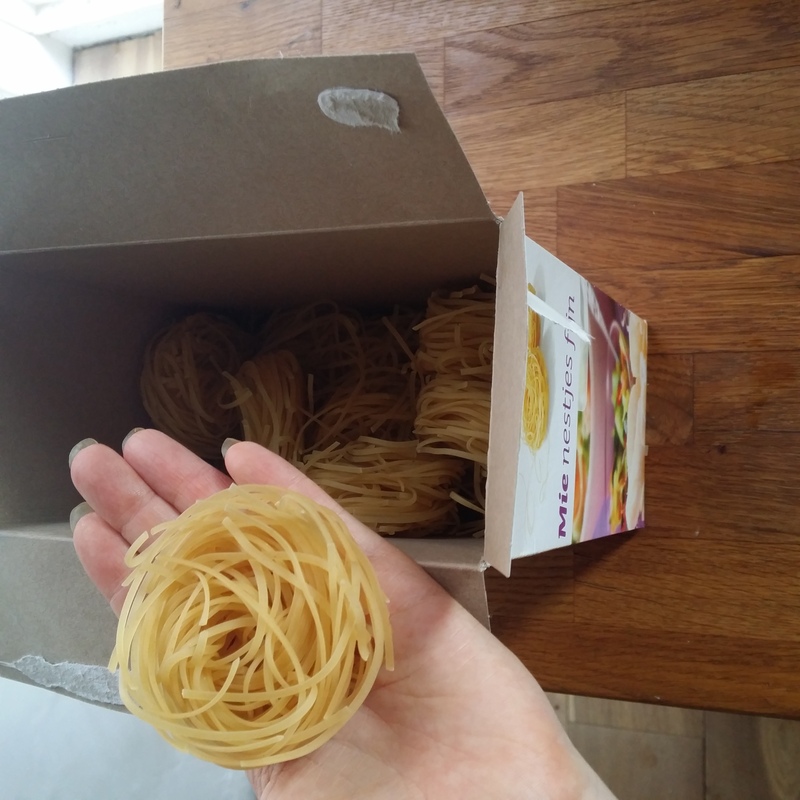 I’ve found these type of noodles are generally plastic-free. 3 x plastic-free. 2x risotto rice and couscous on the right. That’s it for today. I hope you’ve found these tips helpful. Any comments or additions, as always, more than welcome. Did you also find your daily staple foods without plastics? What are your solutions? Wishing you a great Plastic-Free Tuesday today! Thanks for all the brilliant tips! 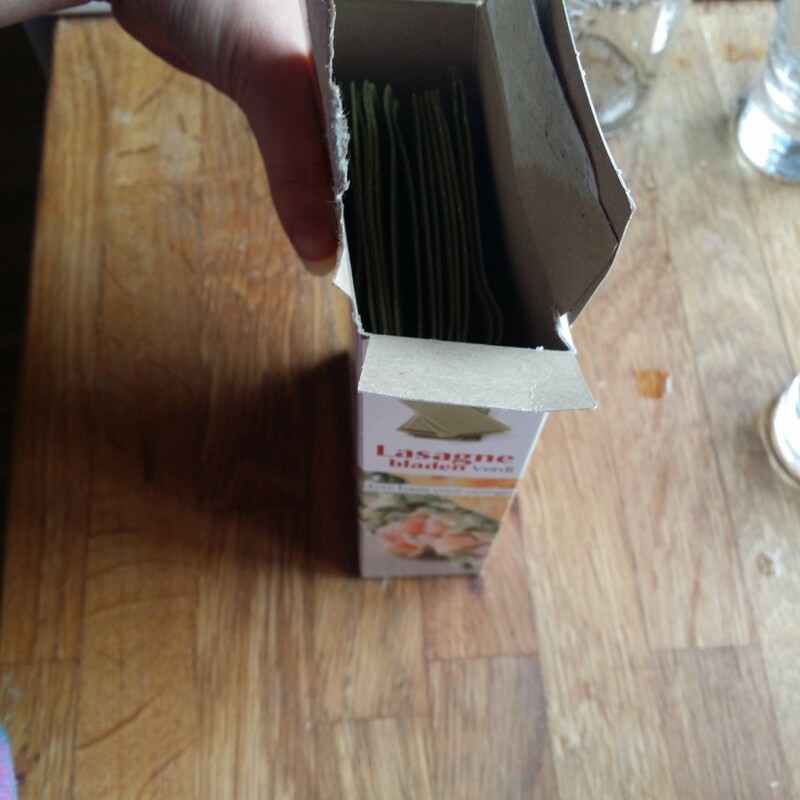 I eat a lot of rice and find the small packets of rice bought in Albert Heijn run out too quickly. Hi Jan! Any chance you could share with us the name and address of the supermarket that sells rice in bulk? It would be great if more people would be able to buy their rice there. Thank you! Asian shops/supermarkets here (e.g. Oriental Plaza) so far dramatic, plastic paradises.. Everything is in plastic there it seems (as I guess in China)! Literally only the baking soda I get there.. even a sauce that I went to buy for Chinese dishes, which is in glass itself, was tightly sealed in a full layer of plastic, top to bottom. So frustrating, not to mention ridiculous and wasteful. Great to hear you are coming to NL soon! Last Sunday we bought 2 kilo glutinous rice in bulk, here in Beijing. We brought our own reusable bag, made of cotton. If I recall correctly, the organic farmers market in the Hague (on Wednesdays) sells rice (as well as beans and nuts) in bulk. You can bring your own bag or food container. 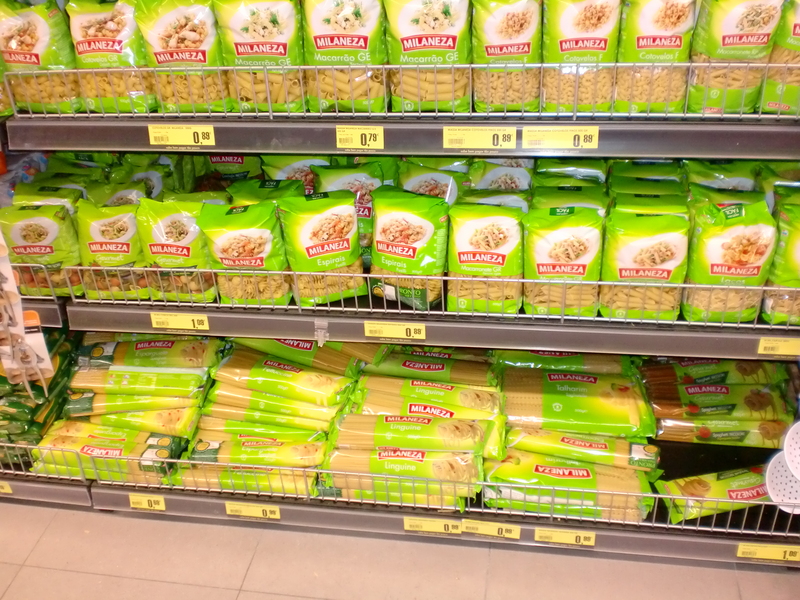 Apart from the Barilla pasta, I think most of these are actually the supermarket inhouse-brand (Albert Heijn or Jumbo). My Jumbo does not have couscous without plastic though, at all, but the Albert Heijn inhouse brand does. (not sure if you’re in the Netherlands, but giving you the info anyways :-)) “Lassie” has many products with plastic it seems.. 🙁 Again, it’s really checking the markings on the box I think! did you find any where you are? I’m trying to switch to organic as much as possible, but that’s not always easy in terms of plastic-free it seems..! 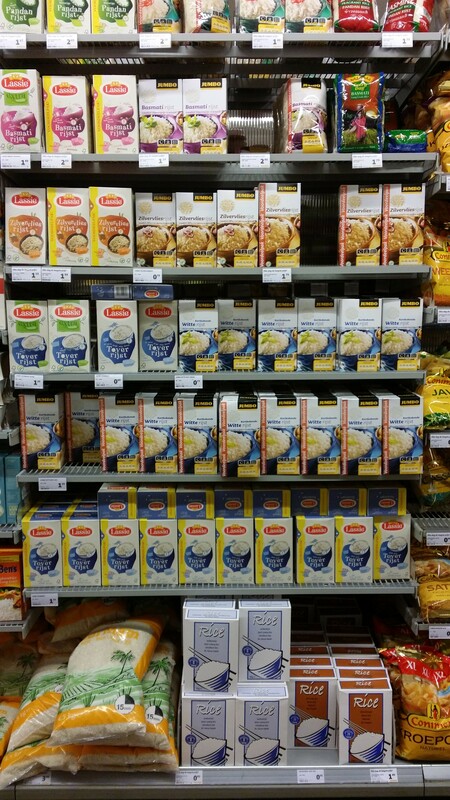 Jumbo and Albert Heijn each have a number of options there, for their inhouse brand, just check it out! Good luck! and let us know if you have any questions!